The enlivening, fresh scent of Lemon Lemongrass Vitalising Body Milk awakens and invigorates. This fast-absorbing, revitalizing body cream is the perfect complement to an active, healthy lifestyle. 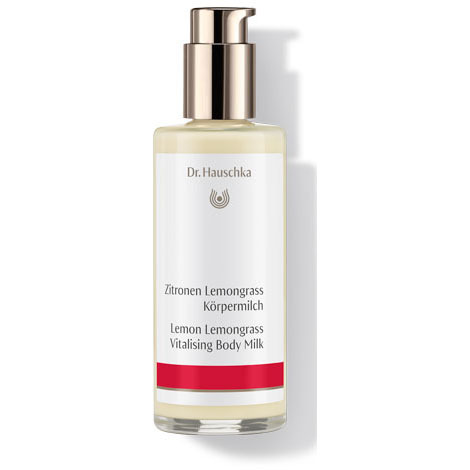 Formulation: Extracts of lemon and lemongrass invigorate and refresh the body, leaving it feeling toned and firm. Quince seed extract soothes and hydrates, promoting increased moisture levels while jojoba, sunflower and olive oils replenish, fortify and nourish the skin for all-day hydration. Water (Aqua), Alcohol, Salvia Officinalis (Sage) Leaf Extract, Prunus Spinosa Fruit Extract, Pyrus Cydonia Seed Extract, Glycerin, Cymbopogon Citratus (Lemongrass) Extract, Prunus Spinosa Flower Extract, Helianthus Annuus (Sunflower) Seed Oil, Arachis Hypogaea (Peanut) Oil, Equisetum Arvense Extract, Olea Europaea (Olive) Fruit Oil, Lysolecithin, Citrus Limon (Lemon) Peel Oil, Fragrance (Parfum)*, Citral*, Limonene*, Linalool*, Geraniol*, Farnesol*, Coumarin*, Citronellol*, Eugenol*, Daucus Carota Sativa (Carrot) Root Extract, Simmondsia Chinensis (Jojoba) Seed Oil, Algin, Xanthan Gum, Silica.